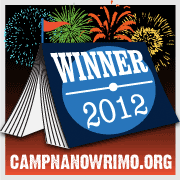 This morning, with the help of a word sprint, I got up to 50,006 words on my August Camp spreadsheet. Opened up all 5 chapter files, copied and pasted into the validator… and found out that Camp had given me an extra 362 words! For some reason they put a few bits of fried onion in the hash browns. Apparently in Atlanta, all breakfast combos come with eggs. I saw lots of other fan-type people in the hotel, on the streets, and in the food court when I picked up dinner, but there’s no real events on this morning and I don’t feel like heading out and making new friends. There’ll be lots to do tomorrow, so I should be resting up. 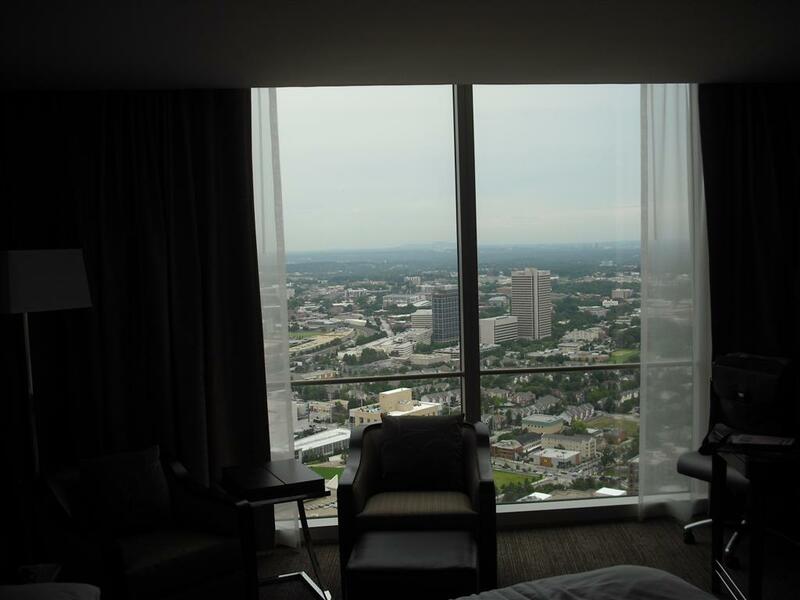 I’m just a bit frantic at the moment trying to make sure that I’m ready to leave for Dragon*Con in the morning, but I wanted to share a few things. …and realized that I’d locked my keyring in the car. With my apartment key on it. I had a spare key to the car – inside the apartment. Along with my cell phone and presumably, a laminated CAA roadside assistance card that I’ve lost track of. It turned out okay. I was able to call the roadside assistance people from the pay phone across the street, they were able to lookup my membership based on my phone number and other info, and a nice gentleman drove up in ten minutes or so, checked my driver’s license to be sure I was who I said I was, and open up my car. I’ve tracked down the little temporary roadside assistance card that I printed out for myself before they mailed me a laminated card, just so I’ve got my CAA number in my wallet, and I may try keeping the two car keys in different pockets for a while again, unless that drives me nuts. What’s your favorite ‘day off’ memory? Beta bugger once again. There’s not much to say about this, except that I will be working once again to help make sure that the Nano site is as bug-free as possible in October. Just maybe possibly a Nano co-ML. I sent in an application to become a National Novel Writing Month co-ML for Hamilton. (That’s a local group leader and organizer of write-ins and other fun outings for crazy obsessed writers.) I haven’t heard back officially, but I think the signs are good that my application will be stamped ‘approved’ – or whatever other really fun thing Sarah Mackey does to initiate a new co-ML. 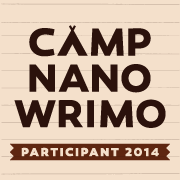 And out of the blue… Grant Faulkner added me as a noveling buddy on the nanowrimo website yesterday evening. I’m not sure if he just happened to log on, realized that he had no noveling buddies, and added the three other wrimos who had already added him as buddies or not, but seeing that little Nanomail notification made me smile. I’m already looking forward to November. Am I the only one? 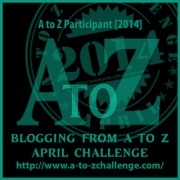 Remember to check out the full list of participants over at the Six Sentence Sunday home site. In the world of the future, anybody can use genetic treatments to look exactly how they want – or can they? Thanks to everybody who’s given me feedback so far. First Six. Second Six. Third Six. Fourth Six. Fifth Six. Sixth Six. Seventh Six. Eighth Six. Ninth Six. When I went back for my booster shots on the growth spurt and muscle builder, my chin already looked different, and I thought I could feel a change in my biceps too. This time a girl gave me my shots – she was blonde and really pretty, and I couldn’t help but notice her engagement ring. She left me sitting alone in the privacy room after, saying that she’d be back to check on me in ten minutes. I counted to sixty after she left, then used keycodes I’d downloaded onto my pocket-Smart to unlock the ‘Employees only’ door. It didn’t take me long to find a supply cabinet with a half-full box of hypodermic vials marked ‘Bright green eyes’ and a long formula reference that I didn’t understand. I knew how to re-sterilize myself, though, and inject myself with a fresh needle. 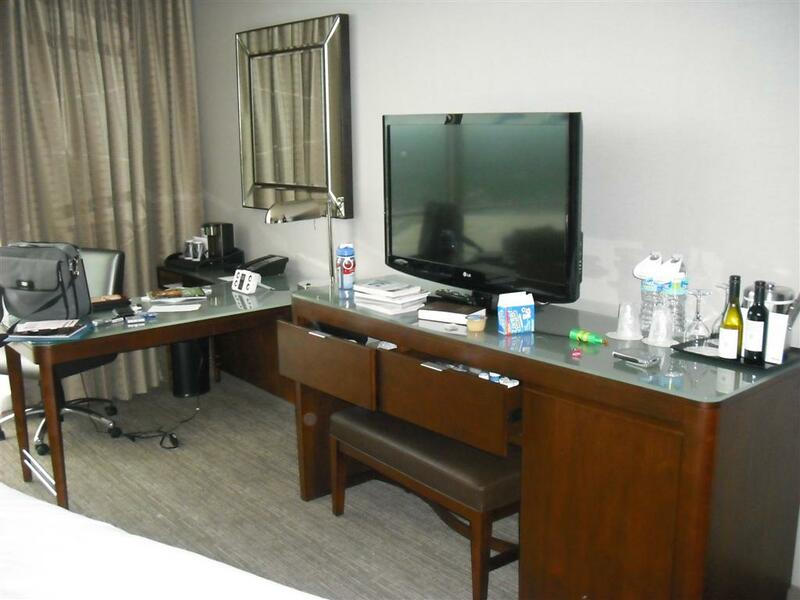 I bailed on Fan Expo early today – or maybe I beat a strategic retreat. By a little after 4 I’d done everything I wanted to and still had the opportunity to do today, and I was tired of being in a crowd and the phones not working well. But I didn’t want to go back to my hotel room because there’s a Browncoats shindig downtown in about two hours. So I’m loitering in the VIA Rail part of Union station nibbling on snacks and enjoying how well the iPhone works without 9000 other phones next to it – until the battery runs out. And I’m thinking about what I accomplished today and the disappointments. 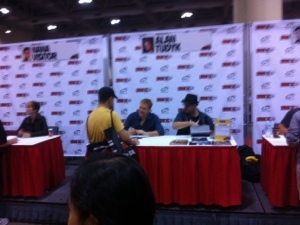 Met Alan Tudyk in his autograph line. Got my copy of “Those Left Behind” signed, bringing that comic up to 5 big damn signatures, and 6 for the blueprint book, which has Melinda Clarke too. Alan loved the shiny detail in the blueprints, and he signed over the cockpit on the cover of course. Played a little fragment of a Settlers of Catan game with a nice fellow from the board games room. Fan Expo Day 2 – A good kind of tired. Okay. Woke up, got Tim’s for breakfast, worked on some of ‘The Witches of Arion’, transferred it to the Tungsten C to work on while I was on downtime at the convention center, got into the shower, and rushed to get dressed and out of the hotel before ten. Got into the show without too many lines, around twenty after. Picked up a ticket for the John Barrowman autograph line, they said it’d be around twenty minutes. There were a few people lined up for James Marsters, but he wasn’t there, and somebody said he was supposed to get there for eleven, so I didn’t wait around there. I checked for the Browncoats booth, (still not there, maybe they don’t have one this year,) and read a bit. Back to the autograph lines, got a book signed by John Barrowman pretty quickly, he was really fun and friendly. By this time James’ line was pretty long and a few people were filtering in for Juliet Landau, so I talked to the people in Juliet’s line, and they said they were hoping that she’d be there around eleven too, so I got in line too, pulled out my Kindle, and waited. And waited. Eleven o’clock comes around, James shows up, his line starts moving. After noon, a volunteer finally shows up and says that Juliet is still in her hotel, and that the earliest she’ll be around is one fifteen. One fifteen is also when James and Juliet were supposed to have a joint photo op according to the program. I bail from the line then, surprised that it doesn’t entirely melt away. I line up for James, then give up when I’m about halfway through, deciding that I don’t really want to spend forty bucks on a repeat signing. So I wander around a bit, go to the board games room, find an old critique partner and talk to her about writing or the lack of it for a few minutes, check out a rules book for “Settlers of Catan”, then go back downstairs to grab some pizza, and I decide to try the Juliet line around one fifteen. 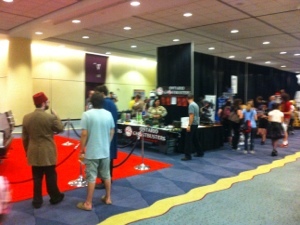 I’ve been inside Fan Expo for a little more than an hour now. At this point on Thursday afternoon, things are relatively quiet, but there’s still some fun stuff going on. I left work just before noon, lugging my suitcase onto the train, and walked up Bay and Yonge streets all the way to Wellesley, sweating up a storm as I went. A nice lady checked me into my room, and I spent half an hour there organizing my stuff and cooling down before taking the subway down and figuring the right way into the convention center through crowd control – though the crowds haven’t really arrived yet. Since I got here I’ve signed up for a Dresden Files RPG session tonight, walked most of the sales floor, and talked to a few guys at the photo sales booth about Kaylee cupcake dress pictures. Jewel Staite isn’t at this show, but I want to get that picture signed by Jewel and Jane Espenson at DragonCon. A fellow customer said that he got the picture at Jewel’s autograph table at Polaris last year, so I think I should be able to track it down in Atlanta. What else? I scouted out the autograph situation a bit. Looks like John Barrowman and Juliet Landauwill be signing tomorrow, but I’ll have to wait until Saturday at least for Rose McGowan and Alan Tudyk. That helps me know what I need to bring to get signed. I’ve seen a few familiar faces around and chatted with Jason R briefly. 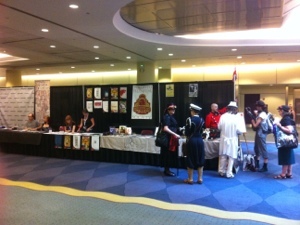 The Toronto Browncoats fan booth isn’t where it’s marked in the programme; I wonder if they let TCON have their space for today. It’s still more than an hour before Julie Benz’s Q&A session. I want to go find the ctv sprawl again and find out more about this ‘arrow’ show, and then maybe I’ll get in line early for Julie and read as I wait. Please excuse any typos in this post as the on-screen keyboard is not really meant for long composition. Well, I’d like to thank all of the Dojo ninjas that have emerged from their hiding places to answer my crazy questions this summer. I think that today will be my last Ninja Spotlight in the series, so I’m pleased to present Shauna Kelley! Out of your favourite fictional characters, who’d make the best sneaky ninja? I’m going with Peter Wiggin from Ender’s Game. In the spin off novels, he definitely becomes a sneaky ninja, but in the original, he is one of the most sneaky teenagers you might imagine. Instead of sneaking out of the house to hang out with friends, however, Peter is sneaking to try and rule the world. Three things– I am working on some clean up of my first novel Max and Menna. The press that originally published the book has ceased operations, and so I am working to make it available for Kindle again. Secondly, my second novel Don’t Wake Up is coming out in November, so I am working on some things to prepare for that. And finally, I am writing a fictionalized memoir about losing someone you love to cancer. This is very tenuously based on my relationship with my mother, who died of Multiple Myeloma two years ago. If you could change one thing from the history of your life, what would it be? Not to sound trite, but nothing. If I could cure cancer and keep my Mom, that would be it, but that seems a bit out of scope for the question. I’ve made mistakes in my life– lots, and lots of huge, staggering, and really stupid mistakes– but I have learned from every one of them. There are things I regret, things I wish had worked out differently, but after 30+ years of trying, I am extremely happy with who and where I am. I wouldn’t give that up to change one thing. I haven’t packed yet, but I’ve been working on my schedule plans, figuring out what Q&A sessions and other events I need to make it to, when I can fit in some role-play gaming, (They’ve got Harry Dresden RPG sessions!) and what I want to take to be signed by whom. 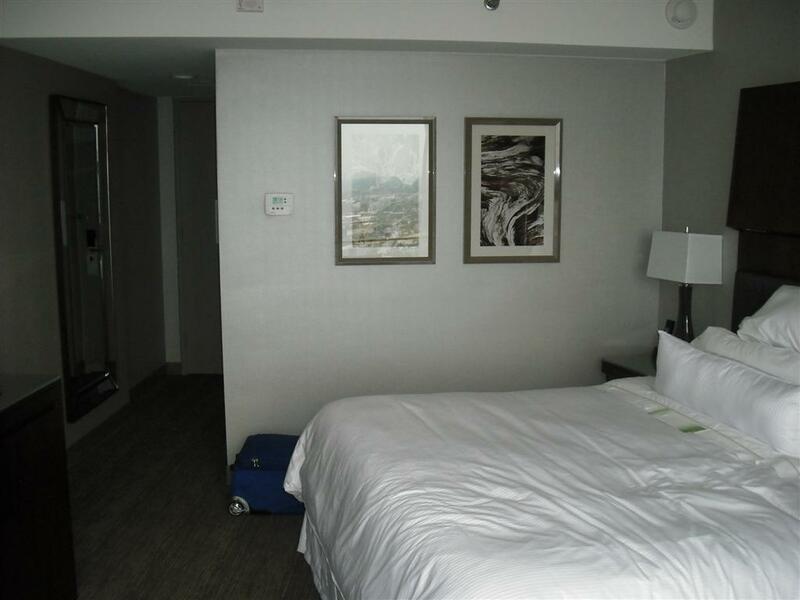 I’m leaving work Thursday around noon, taking the train to Toronto, and checking into a little boutique hotel near the Wellesley subway station that was cheaper than any of the official convention hotels closer to downtown. Then it’s down to the convention center to see how early I can get in – Julie Benz’s Q&A session is on the first night, and hopefully I can fit the gaming in afterward. I’m really excited about meeting Alan Tudyk, but John Barrowman and Juliet Landau should be fun too, also seeing Julie Benz and James Marsters again. I’ll probably be very tired when I get back to the office on Sunday evening to drive back home, but as long as I don’t get into an accident it’ll all be worth it. And then a few days later I fly down to Atlanta for Dragon*Con. You are currently browsing the The Kelworth Files blog archives for August, 2012.